Aim: 1) To sketch the radiation pattern of folded dipole antenna. Apparatus: Antenna, transmitter, receiver-stepper motor controller, dipole antenna, folded dipole antenna stepper pod, connecting cables, direction coupler, slotted line, 20 db attenuator etc. Theory: Another common place one can see dipole is as antennas for the FM band - these are folded dipoles. The tips of the antenna are folded back until they almost meet at the feed point, such that the antenna comprises one entire wavelength. This arrangement has a greater bandwidth than a standard half-wave dipole. If the conductor has a constant radius and cross-section, at resonance the input impedance is four times that of a half-wave dipole. A) To sketch the radiation pattern of folded dipole antenna in azimuth plane on polar plots. 2) The length of antenna is c/2f=(3*10^8)\(2*600*10^6)=25cm end to end. rotation of antenna to the corresponding memory location . 6) Connect RS232 from receiver to computer & transfer the reading by enabling serial mode at receiver . Hence radiation pattern is plotted on polar plot from which gain & beam width is obtained. 7) Beam width is obtained on log plot at 3dB level. 1) Connect the direction coupler to the transmitter tripod to RF out connector . 2) Connect the antenna to the direction coupler to RF in connector. 3) Connect the receiver to the direction coupler at RF sample connector and insert attenuator. 4) Bring the transmitter & receiver to 600MHz and take the reading this will give forward power . 5) Now interchange the connection of transmitter tripod & antenna is connected at RF sample. 6) Now the transmitter tripod is at RFin and antenna is connected at RFout . 7) Note down the reading at receiving at same frequency (600MHz) this will give reverse power. 8) The return loss is hence obtained by Return loss=forward power-reverse. 2. Connect short load at 20cm end of slotted line. 3. Move the probe from 0cm to 20cm that is generator to load end of line. is at & 2nd minima is at . Whether minima has shifted towards load end or generator end. 6 . Thus with antenna connected at load end, 1st minima occurs at cm & 2nd occurs at cm. 9. For calculating VSWR, using directional coupler measuring Return loss of antenna. 13 With ratio of shift in minima /lambda = , rotating anticlockwise from left & locate on outer circle. as real part & as imaginary part. 16. Actual impedance is ( ) 50 = ohms. Conclusion: The Folded dipole antenna was analyzed on the antenna trainer kit. Field Strength of various angle were obtained and radiation pattern were plotted for same. What is folded dipole antenna? What are factors affecting folded dipole antenna gain? What are factors affecting folded dipole antenna beam width? What are factors affecting folded dipole antenna impedance and return loss? 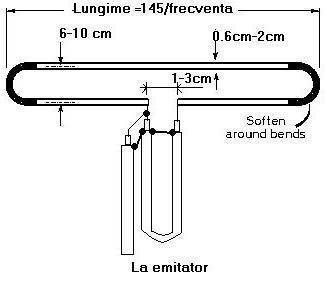 Folded Dipole antenna is generally used for which frequency range? What are the parameters to be considered for the design of a folded dipole antenna? Explain the special features of folded dipole antenna? What is the main advantage of folded dipole antenna? Draw the radiation pattern for folded Dipole antenna? Explain the principle of operation and applications of folded dipole antenna?